What better way to close this year and start the new one than an end of year sale? The discounts are generous as you save anywhere between 50-75% off of various beads and charms. Why not start off on the right foot by finding select stone and Czech glass strands 50% off? Add a little whimsy to your projects with bright and colorful Guatemalan clay. With all packages 25% off, you only need to worry about choosing between birds, turtles, and other fun shapes. With the holiday season winding down, our Christmas themed pewter charms and clay are 50% off- no better time to stock up for next year! 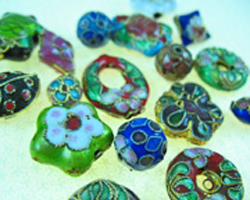 Cloisonne, an art in which metal beads are given enamel colors, was practiced both by the ancient Celts and Chinese. Our beads of this fashion now join the ranks of the 50% off sale! Our vintage glass has also been discounted. Take advantage of this chance to check out beads as they were styled 50 years ago and enjoy 60% off. Last, but most certainly not least, select Pewter charms are a whopping 75% off, making them a bargain worthy of any charm bracelet! Make sure to come by and take advantage of this sale! Prices are good until January 10th, so why not spoil yourself over the new year and make your resolution more beading projects? We hope to be seeing you in soon! Personalize all of your gifts this year with pieces that speak to you and the person you give them to. With many new findings and charms to choose from, you can stylize a gift in a personal and meaningful way. A wealth of Celtic bails match the Celtic knot charms found in our base-metal and sterling section perfectly. New glue-on bails allow you to attach your own pieces to convert them to a pendant. Anything works, from sea-glass to shells! Become inspired by personalized word charms; “Imagine”, “Live”, and “Love” are among the many messages you can give that special someone this year. You can honor your beliefs and other religions world-wide with our religious charms. We carry Buddhist, Christian, Jewish, Pagan, and Hindu symbols, among others. The Tree of Life is an especially popular choice; it holds roots in Chinese, Germanic, and Judaic mythology (among others), symbolizing a connection between all forms of life and the sanctity of nature. 1. A Menorah, an 8-branched candle-holder used in Judaism to commemorate a miracle; a Jewish temple was able to light its halls with oil for 8 nights, despite the fact that it should have only lasted 3. Menorahs are lit during Hanukkah, the 8-day long holiday which celebrates this miracle. 2. A cross is a common symbol for Christianity; a Crucifix is an image of a cross with Jesus nailed upon it. These and angels are popular images in relation to Christmas, a holiday which commemorates the birth of Christ. 3. Holly or a Pentacle are fitting symbols used in relation to pagan beliefs regarding this time of year. According to some pagan mythology, the winter solstice (called Yule) marks a return of light and warmth to the world. This natural phenomenon is explained as a battle between the Holly King, the king of winter, and the Oak King, a deity of summer. On the winter solstice the Oak King defeats the Holly King, allowing greenery to return. This battle repeats itself on the summer solstice, when the Holly King wins and brings winter to the world. The Pentacle represents the 4 elements of nature (earth, air, fire, and water) and the 5th element of spirit. With so many symbols in our cultures and the cultures of our various heritages, creating special and personal jewelry is only the work of finding something that speaks to you. We hope to see you coming by soon, and Merry Christmas, Happy Hanukkah, Good Yule, and Happy Holidays to all! Sale Items for Your Holiday Present Making! The holiday season has definitely arrived! Winter snows and the coziness of Christmas create the perfect atmosphere to hone those craft making skills, and many people are choosing to make gifts rather than buying something manufactured. This is a wonderful opportunity to create something unique and special, and we are here to help. 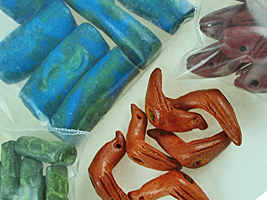 Come enjoy our store specials by receiving 25% off all Cloisonné and bagged Guatemalan Clay beads! 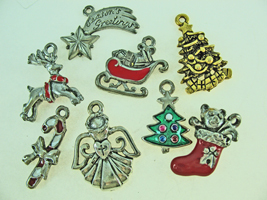 Take a look at our base metal charms; select ones are 50% off, perfect for making those festive party wine charms. Ever popular stone and freshwater pearl strands are also on special: buy one and receive a second strand for 50% off! 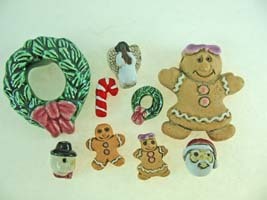 All specials good until Christmas Eve, 2009, perfect for all of your holiday gift making needs! Congratulations to Connie! The whimsical replica of her daughter’s self portrait (drawn at the age of 5) captured many hearts with its fun attitude and bright colors. 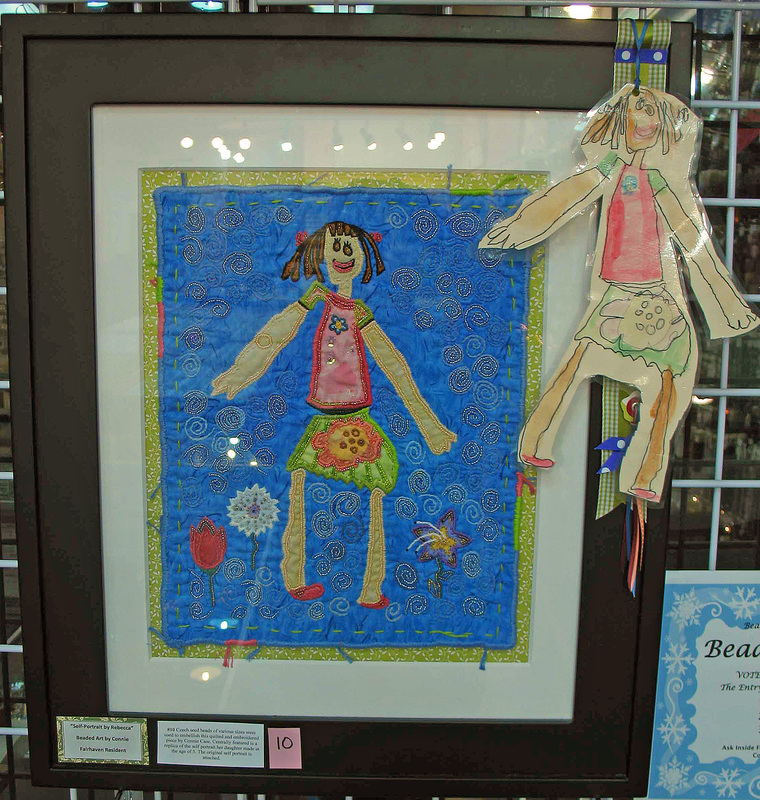 Her quilted piece is playfully embroidered with seed beads. As our first place winner, Connie has won a $100 gift certificate to the Bead Bazaar as well as multitudes of praise. Well done and congratulations! 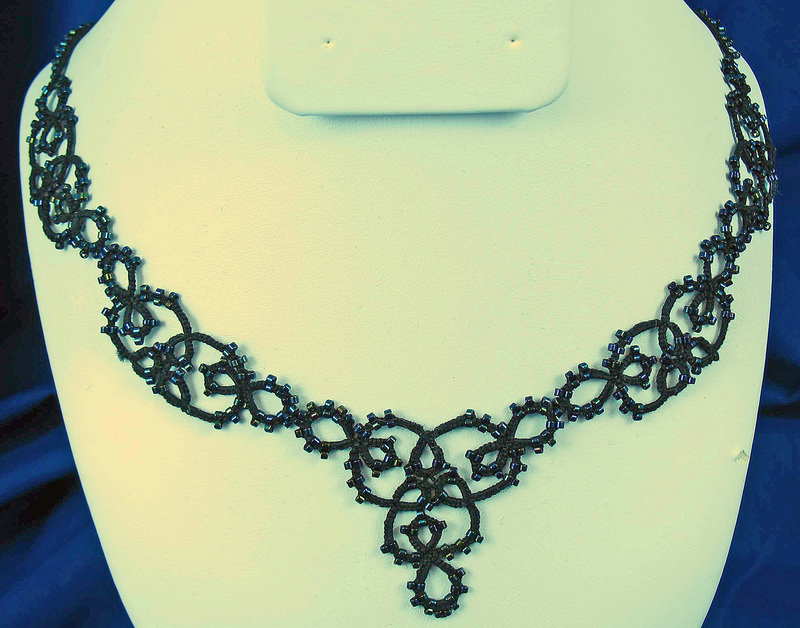 A hearty cheer goes to Nancy for her delicately crafted tatted lace necklace. It’s intricate details and time-consuming technique earned her a well-deserved second place, and a $50 gift certificate to the Bead Bazaar. Nancy sells her pieces at the public market, and more of her work can be found at http://www.designedkeepsakes.etsy.com . Our third place winner will recieve a $25 gift certificate for an embroidered leather purse. She created a rose pattern and family tree using Czech seedbeads in the brick stitch. Thank you once again to everyone who participated and voted in our contest! It is always wonderful to see what our community can create, so we hope to see more entries and meet more artists in our contest next year. Congratulations to all of our winners! 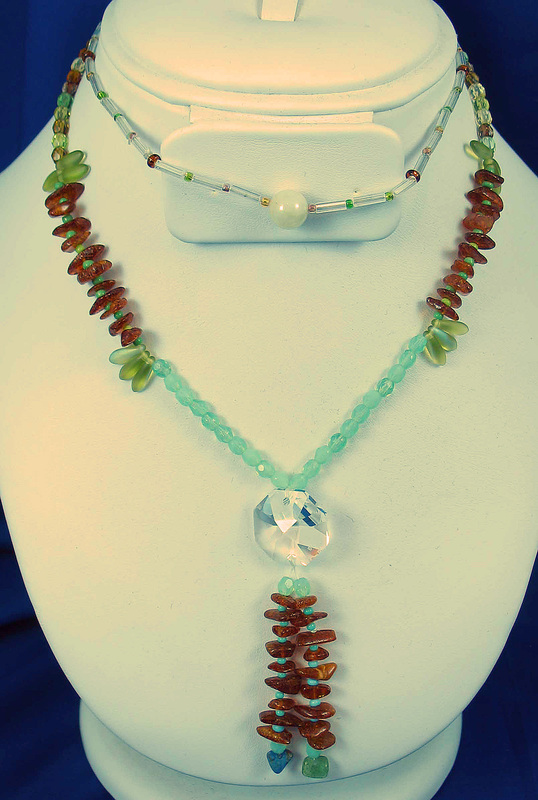 #1This 3-strand necklace submitted by Cherie Walker incorporates both glass and stone elements. 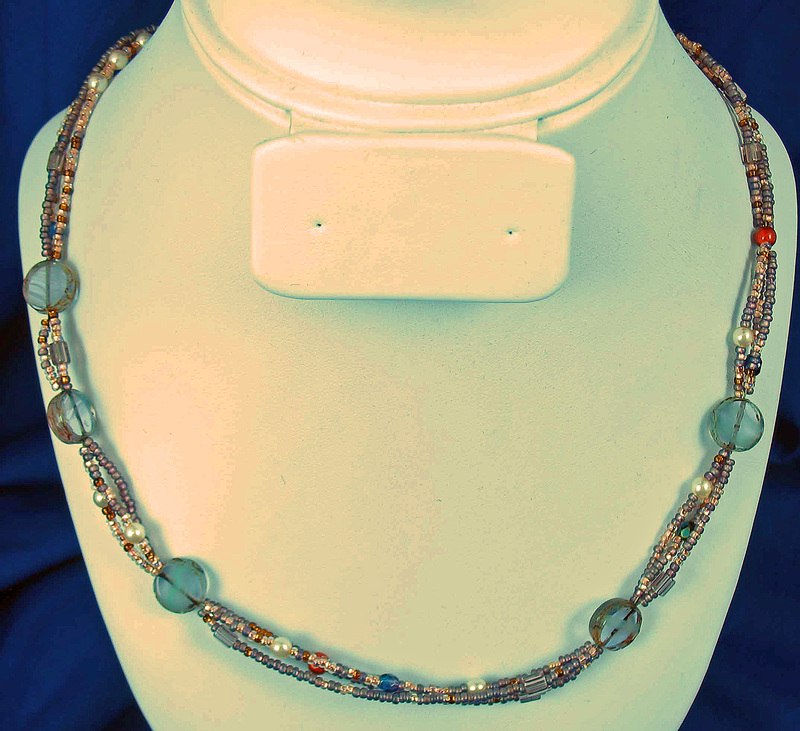 It features hematite, freshwater pearls, Czech fire polished glass, and silver embellishments. #2 A necklace by Marilyn Pali-Rinn showcases Thai silver shells among 3 strands of genuine freshwater pearls. Marilyn used sterling silver and vermeil accents and hand wrapped her lapis and pearl accent, having lots of fun while creating a piece that soothed and spoke to her. #3 Composed entirely with the brick stitch, this bracelet by Shirley Wooten incorporated various metallic hues to demonstrate her pattern making skills. 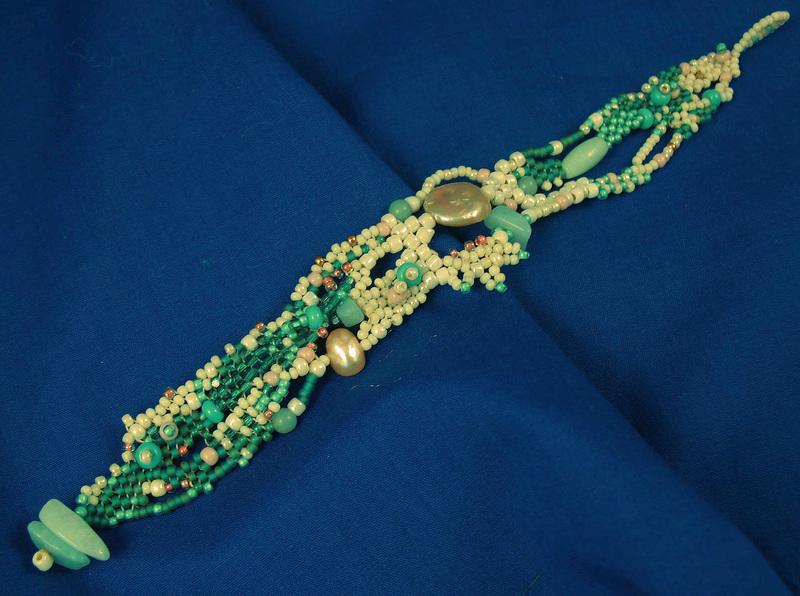 This piece is made of Czech seed beads and the clasp was hand-stitched. This piece by Victoria Jager Kenna is entitled “Truth as witnessed through the prism of nature”. It represents a progression from magma and water into photosynthesis, where the amber/magma changes into rich soil. This leads into white beads, the freshness and awakening of rain. Each member of Victoria’s family has their own necklace, a reminder to speak truth to one another. With over 50 years of beading experience, Madeline had fun combining both brick and peyote stitches, playing with the way the techniques came together in this necklace. This piece is composed of delicas, pink rice pearls, and rhodochrosite rounds, a stone derived from stalactites and stalagmites. Madeline was taught how to bead by her mother and grandmother. 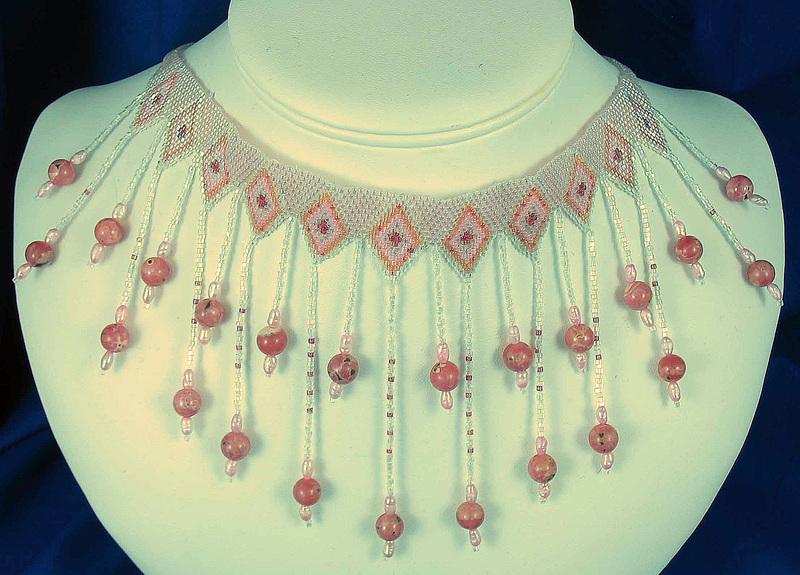 As a lace maker and member of a local lace-making group, Nancy LaHatt created a hand-tatted lace choker. Delicate peacock colored delicas adorn the tatted black cotton thread. Inspired by living in Birch Bay, Kay West wanted to capture an aquatic element in her free-form seed bead bracelet. Thus her color scheme follows an oceanic theme, featuring freshwater pearls and amazonite accents. The central bead is a coin pearl, and her clasp is hand designed. Submitted by JoAnn Howe, this asymmetrical 3-strand necklace is composed mostly of seed beads, with embellishments of purple coin-shaped Czech glass beads. The closure is adorned with bell flower bead caps. Our 9th submission by Karen Williams is a leather purse embroidered with Czech seed beads. Her design features a family tree; the central leaves symbolize herself and her late husband, and each branch represents their children and grandchildren. The tree surrounds her Indian name, “Cinsan’awit”. Czech seed beads of various sizes were used to embellish this quilted and embroidered piece by Connie Case. Centrally featured is a replica of the self-portrait her daughter made at the age of 5. The original self-portrait is attached. Remember to come by and cast your vote for this year’s contest! The prizes the winners will receive are: First Place will receive a $100 gift certificate to the Bead Bazaar to be used for Beads and Supplies, Second Place will receive a $50 gift certificate to the Bead Bazaar, and Third Place will receive a $25 gift certificate to the Bead Bazaar. Our winners will be announced here and also on our website http://www.bellinghambeadbazaar.com, and in store on Monday, December 7th. 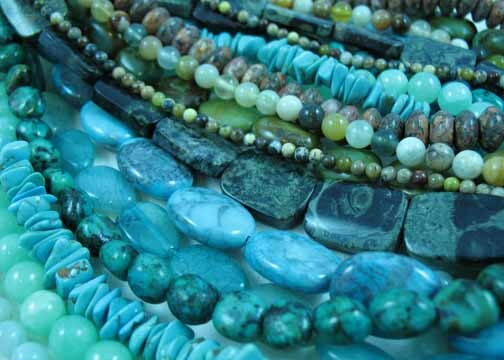 Lots of new Turquoise, Kambaba, Chaorite, Jasper, New Jade, Fresh Water Pearls and Much More available in strands and single beads!